Vilna. Once, this city with its narrow, twisting lanes was renowned as the Jerusalem of the North, a flourishing center of Jewish culture. Seventy years ago, on September 23, 1943, German forces and their helpers charged into the Vilna ghetto and deported the last Jewish residents to camps and mass murder sites. Out of 80,000 Jewish residents of the city, it is estimated that only 600 survived the Holocaust. 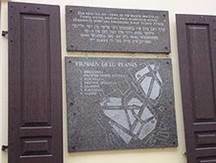 Every year on this date, gatherings are held all over the world to mark the liquidation of the Vilna ghetto. This year, in honor of the 70th anniversary of the ghetto, Lithuania is planning to host dozens of events. Both in the city itself (now Vilnius, the nation's capital) and throughout the country, it is the most extensive program of commemoration ever planned in honor of this solemn occasion. On a recent visit to the land of my Jewish ancestors, I walked through the streets of old Vilna - streets that once thronged with Jewish residents rubbing elbows with Poles, Russians, Belarussians, and Lithuanians. On Zydu gatve (Jewish Street), I remembered the words of a classic memoir of prewar Vilna. Lithuanian Jews "were notorious for peppering their gefilte fish instead of sugaring it as the Polish Jews did," wrote Lucy Davidowicz in "From That Place and Time." Nor were the personalities of the Litvaks (Jews of the northern European region) known for their sweetness. They were said to be characterized by "a certain sharpness or pepperiness, like their gefilte fish." I remembered, too, a rhapsodic poem addressing the city. "You are a dark amulet set in Lithuania," Moyshe Kulbak wrote in his poem "Vilna." "You are a psalm, spelled in clay and in iron, each stone a prayer; a hymn every wall." Indeed, I could sense the layers of antiquity in this place. It felt like holy ground. I was in Lithuania in connection with the release of the Lithuanian edition of my book, "We Are Here: Memories of the Lithuanian Holocaust." I traveled to six Lithuanian cities to speak to students, teachers, museum directors, and tolerance leaders about Jewish history and the Holocaust. Wherever I went, I wondered: What are the prospects for Jewish remembrance in this post-Soviet, post-Holocaust country, now home to only 4,000 Jews? Can Vilnius remember Vilna? I felt encouraged by the earnest and heart-felt questions posed by students, including those from the Sholom Aleichem High School in Vilnius. "Why did the Holocaust happen?" they asked. "What is the best way to fight racism? What do we need to do to make sure this tragic story never happens again?" Anti-Semitism is by no means absent in Lithuania today. I saw swastikas. Right-wing nationalists are present and influential in Lithuanian politics, and there is plenty to criticize in the actions and inactions of the Lithuanian government. These tendencies make Lithuania's plans for observing the 70th anniversary of the ghetto liquidation all the more important. The government has announced plans for installing new memorial stones and plaques. The mass murder site in the forest of Ponar, where tens of thousands of Jews met their deaths, will be refurbished. The fourth World Congress of Litvaks will draw participants from around the globe. Concerts, theatrical performances, and panel discussions will be held. Services will take place in the city's one surviving synagogue, the Choral Shul. New teacher training courses will strengthen educational programming. Plans also call for Lithuania to move ahead with compensating Jews for property seized during the Nazi and Soviet eras. And as in recent years, Lithuanian citizens will gather at museums and community centers to read out, one by one and hour by hour, the names of Holocaust victims. One of Lithuania's most influential tolerance leaders, a survivor of the Kovno ghetto, stresses that remembering Jewish heritage - and facing the facts of the Holocaust - is vital to building an active civil society, "As long as you are hiding the truth, as long as you fail to come to terms with your past," Irena Veisaite told me, "you cannot build your future." In memory of the Vilna ghetto, it is traditional to sing the Partisan Hymn, composed in the ghetto in 1943, with its stirring refrain, "Mir zaynen do" - "We are here!" So many of those who sang that song in the ghetto died. So few survived. But we are here. In Vilnius, in Lithuania, and throughout the world, we can remember those who perished. We can honor the proud Jewish heritage that once flowered in Eastern Europe. And we can do our part to help prevent future genocides. Ellen Cassedy is the author of "We Are Here: Memories of the Lithuanian Holocaust" (University of Nebraska Press). Visit her website at www.ellencassedy.com.